Profiling all-American heroes has become something of a motif for Clint Eastwood the director. The nationalistic patriotism of American Sniper even proved a little too uncomfortable for some in 2014. He’s on much safer ground here. Which certainly can’t be said for the pilot and passengers of US Airways Flight 1549 in January 2009. That Captain Chesley Sullenberger landed his stricken domestic flight on the Hudson River in New York made global news of course. Against a backdrop of relentlessly distressing world events, the media loves an inspiring tale of heroism. So much so that it’s gone down as the miracle on the Hudson. The outcome being so well known forces this production to approach take-off from a more unorthodox angle. In the immediate aftermath of the landing, Sully (Tom Hanks) is struggling to come to terms with his instantaneous fame. The question of whether he actually did the right thing hangs in the black clouds above him. A question with the potential to ruin his career, his reputation, his life. Did he truly save his passengers? Or did his rash decisions needlessly endanger those in his care, when an entirely safe alternative was perfectly achievable? The National Transportation Safety Board is investigating (helmed by Breaking Bad’s Anna Gunn in imperious form), and they have compelling evidence that the aircraft could have made it back to LaGuardia airport. The airport from which it took off only seven minutes prior to colliding with a flock of geese, disabling both engines directly above the city. So it’s the unfolding inquiry that provides the narrative flight path. Seeing the catastrophe recreated is a core draw of the film though, naturally. And we are not disappointed, as the pilot and his deputy (Aaron Eckhart), under heavy scrutiny, are forced to relive every single second of such a rapidly unfolding and intense crisis. With Eastwood behind the camera, and Hanks the lead, the feeling of being in safe hands is deeply satisfying. Unlike the passengers, it’s a pleasure to consciously sit back and enjoy the ride. Hanks’ later period sees him at the perfect altitude to play the role. The everyman shtick that fuels his consistent appeal is uniquely suited to a man of such bravery, experience, and all-too common doubts and anxieties. It’s also a relief to see Aaron Eckhart in something well constructed, and positive spirited, after the nonsensical gun-toting anti-terror tripe that was London Has Fallen (2016), and the abomination that was I, Frankenstein (2014). Eastwood clearly wants to immortalise Sully the hero. But the lead character’s recurring nightmares in the aftermath allow Clint to explore something deeper, and much darker. Sullenberger is traumatised by the horror he so narrowly averted. He’s endlessly woken by visions of planes ploughing into buildings in downtown Manhattan. As the world still comes to terms with the magnitude of what happened there in September 2001, this is remarkably explicit, unsettling stuff. To face up it so directly, it’s shocking to discover just how shocking it still is, a full fifteen years later. It’s still raw. The central character’s trumpeted valour, then, provides a small component of the ongoing recovery for the indelibly terrifying events of that day. For here is a man who prevented a chillingly similar (though accidental) tragedy happening again. 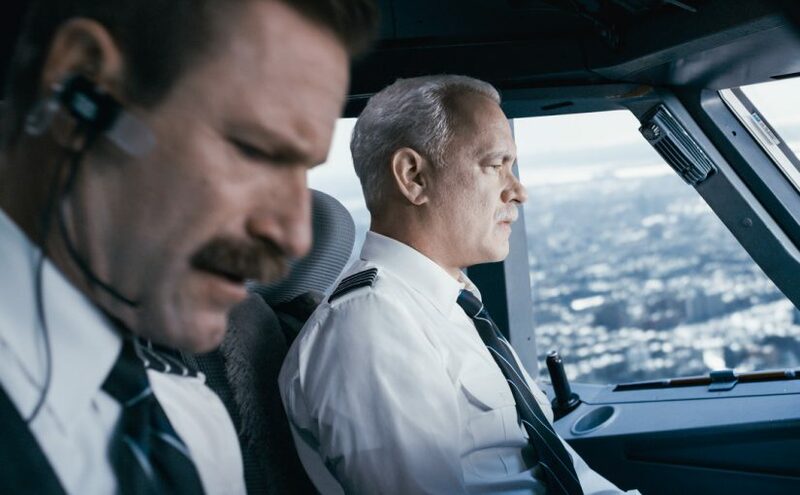 Sully is a gratifyingly grounded adaptation of the making of a modern-day reluctant hero, and a mainstream venting of the residual shock that still haunts ground zero. Post-credits, seeing the man himself surrounded by his grateful, adoring passengers cannot fail to lift the spirit on fact-based feel-good thermals.